Mustang Island beaches promise a glorious experience of surf and sand, especially the portion that stretches between I.B. Magee Park in Port Aransas to Mustang Island State Park in Corpus Christi. That stretch is known as both Mustang Beach and Port Aransas Beach. It is the perfect place to spend an afternoon, a weekend, or a lifetime. A gem among the many Port Aransas and Corpus Christi beaches, Mustang Beach is part of Mustang Island, an 18-mile-long barrier island on the Texas coastline. 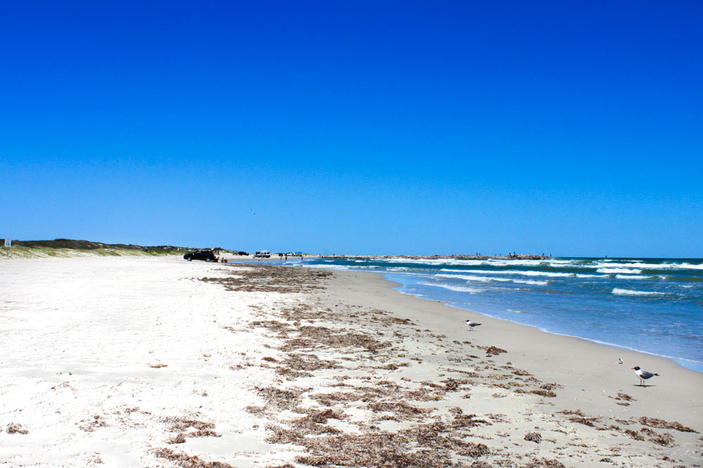 One of the Nueces County beaches, Mustang Beach can be reached via the JFK Causeway that connects Corpus Christi to Padre Island or by ferry through Port Aransas at the north end of the island on Texas 361. Mustang Island is a driving beach where you’ll find cars, trucks, and golf carts taking in the sights and sounds. Roll down the windows to enjoy the fresh air while listening to the surf roll in and the seagulls screech. Rent a beach buggy golf cart and you won’t have to roll down your windows. You’ll be ready to make a stop and immediately jump from cart to seaside as part of your exploration. When driving a registered vehicle rather than a cart, you will need a $12 parking permit, which is good for the entire year. Miles of sandy beach await with hours of fun splashing, birding, shelling, or just soaking up the sun. You can bring or rent a surfboard when waves are high enough or take your kayak or standup paddleboard when the waves die down. The warm Gulf waters are also great for fishing and crabbing. You can fish from the shallows, the jetties, or Horace Caldwell Pier for a fresh catch every day. For a fishing adventure out on the water, charter a deep-sea fishing boat from Port Aransas. Your fishing guide will take you to the best spots for a great catch. If you need a break from the beach, you will find plenty of shopping, restaurants, and activities in Port Aransas, which is a beachside community of about 4,000. Restaurants feature fresh fish and family-friendly eateries where you can find something for everyone, including some of the best pizza around. You can really soak up the fresh air and sun for a day or a full week of things to do. This 5-mile stretch of open beach is on the southern third of Mustang Island. You won’t need a parking permit here, but the park does charge admission. You can bring all kinds of gear to the park to play with on the beach or in the water. Mustang Island State Park has an exquisite stretch of beach perfect for swimming, fishing, skimboarding, bodysurfing, boogie boarding, and surfing. Or, you can just hang out on the sand for sunbathing, picnicking, camping, hiking, running, biking, or birding. Birding is especially excellent during the fall and spring when millions of feathered creatures from hawks to hummingbirds migrate through South Texas. For kayakers and fishermen, the park also offers the Mustang Island State Park Paddling Trail, which follows the shoreline of Mustang Island through some of the area’s top-notch shallow-water fishing spots. 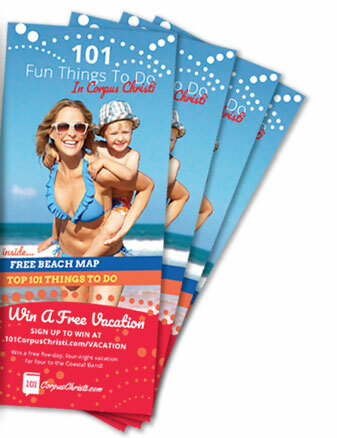 For directions to the beach from Texas 361, visit the Texas Parks and Wildlife Department website. Entrance into this protected part of the beach is available year-round, 7 a.m.-10 p.m. Admission is $5 per person and free for children 12 years and younger. The section of Mustang Island that stretches north between Mustang Island State Park to I.B. Magee Beach and Horace Caldwell Pier in Port Aransas is known as both Mustang Beach and Port Aransas Beach. It requires a $12 year-round parking permit to have a vehicle on the beach. Permits are available at any Stripes convenience store. Mustang Beach is an exquisite stretch of beach perfect for swimming, fishing, skimboarding, bodysurfing, boogie boarding and surfing. Or, you can just hang out on the sand for some sunbathing, picnicking, camping, hiking, running, biking or birding. It is a favorite hang out during Spring Break, which happens for one to two weeks each March. Rules are tightened during Spring Break weeks, which usually involves an alcohol curfew. Port Aransas Beach is available via Access Roads 1, 1A, 2, and 3. In some places a 4x4 may be necessary depending on sand conditions.